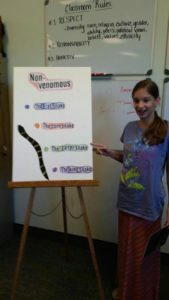 Thirteen year old Katelyn Ruff, was a Silver Medal presentation winner at the West District Presentation Competition in Macon County N.C.. Katelyn did a very informative presentation on the snakes of Western North Carolina, how to identify them and what to do should you come in contact with one. She then went on to compete at the State competition in Raleigh on July 29th. We are very proud of how well Katelyn did for her very first time giving a 4-H Presentation! !